Nicholas Jimenez is and artist that works for MACLA as a Program Assistant for their Digital Media and Culture (DMC) Studio. He's also studying Industrial Design at SJSU. 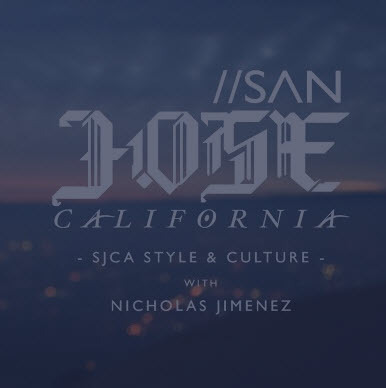 He has a weekly vlog called SJCA Style & Culture that highlights a lot of great things happening in the area. "I want to invite people to see a first-hand account of what it's like to experience some of the festivals, meet some of the great people, and see the many styles and cultures in our area. Also, as you may know, working within the visual and performance art scene we meet a lot of interesting people, organizations, and gain exclusive access to some awesome stuff and I want to share it all! People can expect to see interviews with local artists, designers, entrepreneurs, and fashionistas that are working on interesting projects that affect us all. As well as, local music videos, event highlights of local acts and performers at events near the South Bay, and San Francisco Bay. And also some vlogs about the day to day activities of the team behind it all." To access the weekly show and learn more, click here! This place looks familiar perhaps. This dreamy location meets real glam at the hands of the manager. It’s sophistication with a dash of bliss. At our visit to these event venues there were several highlights.